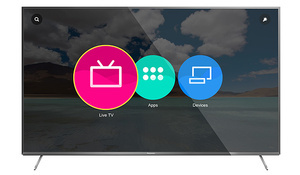 Mozilla has announced that the first Panasonic VIERA TVs running on the Firefox OS are now available for sale. The TVs are available in Europe and will launch worldwide in the coming months. "Through our partnership with Mozilla and the openness and flexibility of Firefox OS, we have been able to create a more user friendly and customizable TV UI. This allows us to provide a better user experience for our consumers providing a differentiator in the Smart TV market," said Masahiro Shinada, Director of the TV Business Division at Panasonic Corporation. "We're happy to partner with Panasonic to bring the first Smart TVs powered by Firefox OS to the world," said Andreas Gal, Mozilla CTO. "With Firefox and Firefox OS powered devices, users can enjoy a custom and connected Web experience and take their favorite content (apps, videos, photos, websites) across devices without being locked into one proprietary ecosystem or brand." There are six models running the operating system, the CR850, CR730, CX800, CX750, CX700 and CX680. Mozilla's Smart TV operating system has a customizable UI that allows for quicker access to favorites including streaming channels, apps, websites, bookmarks and more.